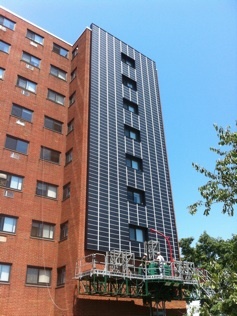 We’ve just completed another 10 story high solar hot air system in Salem, MA - this time using the Lubi™ Solar system from Enerconcept. The system installed in just under 4 weeks, and included some custom structural framing systems to deal with a brick facade that was not able to support the added loads. Thanks to Preservation of Affordable Housing for having us work together on another exciting project!